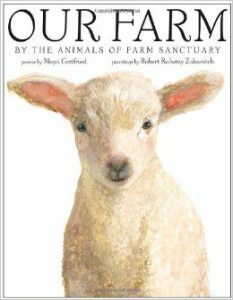 I am very pleased to make “Our Farm . . .” our first book review on “The Read-Aloud Connection.” Author Maya Gottfried and artist Robert Rahway Zakanitch made it their mission to portray the truly individual spirits of the beautiful, sentient animals of Farm Sanctuary. The book conveys a loving, peaceful spirit, which is why we have made it the keystone read aloud for our Peaceable Farm Collection. Maya Gottfried based her poems on her volunteer experience with the real animals of Farm Sanctuary, a safe haven for injured or abused farm animals with locations in New York and California. The short, playful poems are “narrated” by some of the shelter’s inhabitants: Gabriella, a bantam chicken; Maya, a cow; Diego, a duck; and others; and vary in style (rhymed meter, free verse, haiku) adding to the unique portrayal of each animal. The animals speak about the bliss of living naturally in grass and dirt and roaming freely. Watercolorist Robert Rahway Zakanitch’s illustrations are superb. Each one is a collectible work of art, exhibiting a masterful technique, tenderness, subtlety, and humor. The cover image of one vulnerable lamb is particularly moving. I love that the book designer also included the illustrator’s sketches, adding an easy informality while providing more insight into the nature of each animal. A final note in the back of the book fills in details of the farm sanctuary movement for adults or older students. While there are many books for children with settings in and around a farm – some humorous and anthropomorphic, others strictly descriptive and factual – there are no others of such quality for young children on farm sanctuary life, and few that so perfectly capture the essence of each creature with compassion and respect. The compelling innocence of “Our Farm” and the challenging perspective it offers to the traditonal farm theme in children’s books make it an excellent choice for classroom libraries.